At the time, Hemingway was just beginning to make a name for himself, with one book in print and another in production, both published by small avant-garde presses in Paris. In the fall of 1923 he spent a miserable four months in Canada, working at the Toronto Star under a tyrannical boss. He felt “all constipated up with stuff to write, that I’ve got to write before it goes bad in me,” he wrote in a letter that November. When Hemingway quit journalism and returned to Paris in January 1924 to devote himself to his art, the stories began to stream forth — spare, modernist works in which he attempted to do with words what Cézanne had done in his paintings, to create by leaving out. 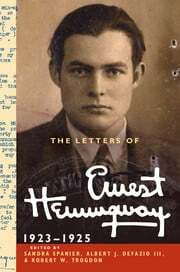 By the fall of 1924, Hemingway had a book’s worth of material, and his friend Donald Ogden Stewart, a popular humorist who had published in Vanity Fair, was circulating the manuscript among New York publishers. Titled In Our Time, it included such now-classic stories as “Indian Camp,” “Cat in the Rain,” “Soldier’s Home,” and “Big Two-Hearted River” — tales of violence, loss, postwar dislocation, and trauma. John Peale Bishop asked me several times while he was in Paris to let him have something for the Literary Hors d’Oeuvres of Vanity Fair. 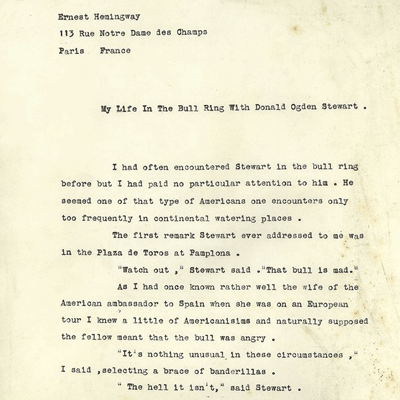 Then I was doing nothing but serious stories but lately I have been feeling so low in my mind that I am sending you the enclosed account of my life in the bull ring with Don Stewart. Perhaps you can use the pictures. Most of them were taken from inside the ring. Don, Dos Passos, George O’Neil and I were all at Pamplona for the six days of bull fighting they have there each July, amateur fights each morning and the best corridas in Spain in the afternoon. I had tried the amateur game the year before and we all tried it this year. Dos was quite wonderful because, of course, he couldn’t see the bulls at all. Once he jumped the fence and went home under the impression that the fight was over when what had really happened was that the crowd has swarmed over the barrerra with the bull in the midst of them and Dos had just beaten him out the door. The matadors who fought in the afternoon fights went in the ring in the morning and coached Don and me. We were in the ring five different mornings and played each time to a house of about 20,000. It was very fine because the town split into two factions: the humanitarians who used to wait on us in a committee and urge us to retire while we were still able and the true afficionados who used to come in a body to the hotel each morning at six o’clock and keep us surrounded on our way to the bull ring to make sure we did not escape. Each night during the dancing after the true afficionados had plied us with their wine bottles we would get enthusiastic and promise to go into the ring again the next day and the aficionados never failed to show up at six o’clock to hold us to our promise. My Life In The Bull Ring With Donald Ogden Stewart. I had often encountered Stewart in the bull ring before but I had paid no particular attention to him. He seemed one of that type of Americans one encounters only too frequently in continental watering places. The first remark Stewart ever addressed to me was in the Plaza de Toros at Pamplona. As I had once known rather well the wife of the American ambassador to Spain when she was on an European tour I knew a little of Americanisims and naturally supposed the fellow meant that the bull was angry. “It’s nothing unusual in these circumstances,” I said, selecting a brace of banderillas. “The hell it isn’t,” said Stewart. “I tell you that bull’s mad,” Stewart shouted. By this time the crowd was taking a hand in affairs and commenced to shout encouragement at Stewart and hurl insults at myself. “We want Don Stewart!” was the burden of their shouting and I soon saw that they had confused his first name with a Spanish title and taking Stewart for a fellow countryman were attempting to make a national hero of him. “Give us Don!” a large red faced fellow was shouting almost into my ear. “Give us our money back!” others cried. “Give us our money back and give us Don!” the red faced chap combined the two shouts. “We want Don Stewart,” a section of the arena filled with young roughs commenced shouting. Just then some one hurled a ripe tomato that struck me full in the face. That was hardly cricket and I turned on the crowd. I raised my hand for silence and the crowd were stilled. I saw that I still retained my old popularity and as I cleared the tomato from my eyes with a handkerchief the Queen Mother had given me I determined to teach the fickle crowd their lesson. It took rather more than a quarter of an hour to say this in Castilian but I was well repaid by the roar of applause that went up as I finished. “Don Stewart, Don Stewart, Don Stewart,” the young roughs were chanting. The large Spaniard in the seats just behind me seemed in the grip of some blood lust. I turned, bowed at the crowd with the best grace I could muster and handed my sword and muleta to Stewart. Stewart accepted them with a muttered word of thanks. He turned from me with a quick firm handclasp and addressed the crowd. A rather seedy individual detached himself from a group of what were obviously medical students and rose to his feet. “I said a doctor,” Steward said in a harsh voice. “I thought you said a dentist,” he muttered. “Is there no doctor in the house? Stewart called. I commenced to like the fellow. Pulling his bowler hat, no, now I recollect it was a cap, Stewart never wore his bowler into the ring, down over his eyes Stewart again addressed the crowd. “I swear to you that I will kill this bull or that he will kill me,” he pronounced the oath in the Old Castilian. There was a rustle of applause for his choice of dialects. Stewart turned and cast his sword and muleta into the audience. A deathlike hush fell. “He’s going to kill him with his bare hands,” someone cried. In back of me the Spaniard with the blood lust rorocked back and forth. Stewart grasped me by the hand. “Will you stand by me Hemingway?” he asked. I looked into his clear gray eyes. “To the death,” I said. Stewart jumped sharply to one side. “Don’t mention that word,” he said. Stewart strode toward the bull and as the bull charged Stewart charged. I had never seen anything like it since the death of Gallito. There was a confused moment that I find it difficult now to reconstruct and I only remember Stewart and the bull tossing each other round and round the ring. Then it was over and Stewart stood clear to let the bull fall. He had killed him with his naked hands. Poor fellow he was a dreadful sight. His ribs stuck out like the bones of an old corset. He was holding in his pancreas with his left hand. As I reached him a small boy who had raced from the barrier stooped down in the sand and picked up something. He handed it to Stewart who hurriedly tucked it into place. It was his duodenum. “You’d better wash that,” I urged him. “It doesn’t matter,” Stewart said, and fainted. When he regained consciousness we were surrounded by a crowd. They were trying to cut souvenirs from his clothing. Already a lively traffic in these was springing up all over the Arena. Stewart made a sign to me. I bent close. He whispered in my ear. “Tell them what I did to Philadelphia Jack O’Brien,” he whispered hoarsely. I did not know the gentleman in question. But I had seen Stewart in action with that mad bull. Perhaps I let my imagination run a little. But holding Stewart in my arms I told them. In my best Old Castilian which I had reserved for the occasion of my son’s twenty first birthday I told them. Stewart only opened his eyes once while I was speaking. Happily the poor fellow recovered. Excerpted from The Letters of Ernest Hemingway: Volume 2, 1923–1925, edited by Sandra Spanier, Albert J. DeFazio III, and Robert W. Trogdon, published this month by Cambridge University Press.